With four features, a made-for-TV documentary and two shorts, Korean films dominated the small festival’s line-up of 13 films. Features screened included: <Never Ending Story>, CHUNG Ji-young’s <Unbowed>, HWANG In-ho’s <Spellbound> and KIM Dal-joong’s <Pacemaker>. Also shown was <A Personal Journey Through Time>, a documentary which reunites Korean director LEE Myung-se with many of the actors and actresses he has worked with over his career, originally aired during MBC’s 50th Anniversary Special <Time> television series . Rounding out the selections were HAN Jae-bin’s <A day> and HAE Hwan’s <Flower>, two short films. 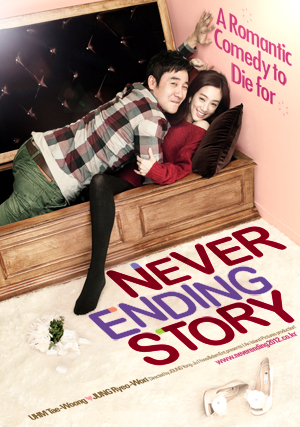 <Never Ending Story> follows a couple who meet each other through a dating service and are both soon after diagnosed with terminal illnesses. Despite some star power with UHM Tae-woong and JUNGRyeo-won in the lead roles, the film could only muster roughly 275,000 admissions at the domestic box office. It was able to hold off Taiwan’s <Jump! Ashin> for Fukuoka’s Grand Prize. International sales representative 9ers Entertainment said the film has already been sold to both Indonesia and Thailand, where it will soon be released. The Fukuoka Asian Film Festival was established in 1987 by Japanese director Shohei IMAMURA and has since become one of Japan’s more well established and well regarded film festivals. It was held from July 6-15, with <Unbowed> as its opening film.